I’m not sure why they look a little dry in these photos, but these waffles came out moist, fluffy and wonderfully chocolatey. The buttermilk made them moist and the cocoa and mini-semisweet chips made them super duper chocolatey. Y-U-M-! Taste Tester recently received a waffle iron for his birthday, so I’ve set out to find yummy recipes to put it to use! This morning we tried Alton Brown’s Chocolate Waffles, which was easily the best recipe we’ve made so far. 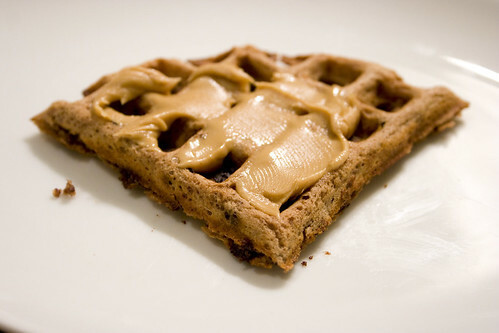 I only slathered peanut butter (good ol’fashioned Jif, to be specific) on one small piece, assuming that a whole chocolate peanut butter waffle would be too heavy for the morning. However, I was wrong! While butter was great on these, the peanut butter was awesome! This was truly a dessert masquerading as breakfast. You have to try them! In Taste Tester’s opinion, the only thing missing from our yummy breakfast was some fresh whipped cream. I’ll have to keep that in mind for next time I make this dessert – er – breakfast. Get the recipe at Food Network and start tomorrow off with a large stack of chocolate peanut butter goodness! Thanks to Eileen, Kate and Dustin for encouraging our waffle craze! WOW! Great combo! I don’t believe I’ve ever had chocolate waffles before. If you’re looking for more waffle recipes, these Banana Cinnamon Waffles were oh-so good! I can think of few better ways to enjoy a breakfast! I will be adding some PB to my next batch of waffles or pancakes. Whoa! Yum! I would add some sliced bananas and make a waffle sandwich.